In a new program, Macron's government is offering Arabic lessons in France's public schools to children as young as six years old, purportedly to facilitate integration. French authorities seem to ignore that the vast majority of terrorists from France have been French citizens, who spoke a perfect French and, unlike their parents, were born in France. They were perfectly "integrated". They rejected it. US President Donald Trump and French President Emmanuel Macron engaged in a public diplomatic clash just days before Trump visited France this month. The spat began when, in a radio interview, Macron suggested that Europe needed an army to protect itself from the US. "We have to protect ourselves with respect to China, Russia and even the United States of America," said Macron. Protecting France from the United States? In a November 11 speech commemorating World War I, Macron in a diplomatic welcome to his guest, attacked "nationalism". President Trump had proudly called himself a "nationalist" less than three weeks before. Gérard Collomb, France's Interior Minister until last month and currently Mayor of Lyon, is apparently pessimistic about the situation in his country, according to comments reported by Valeurs Actuelles. 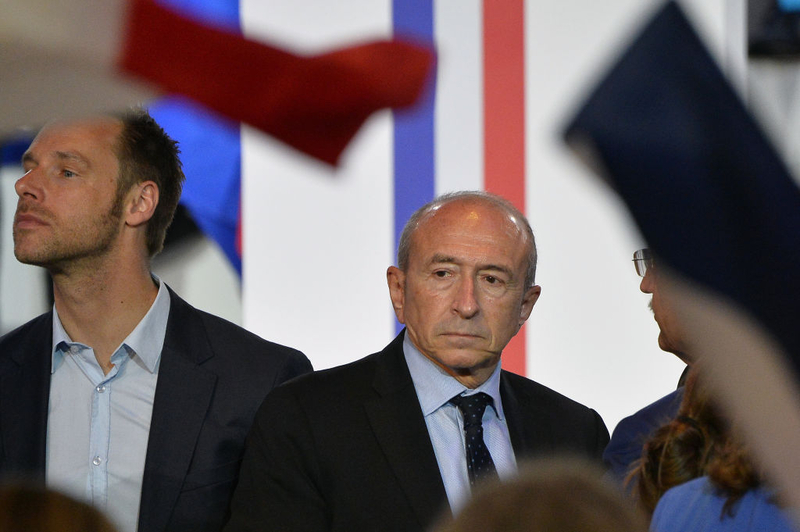 "People do not want to live together," Collomb lamented, continuing that the responsibility for security during the recent immigration has been "huge." Collomb also warned that there is only a "little time" to improve the situation. "It's difficult to estimate but I would say that in five years the situation could become irreversible. Yes, we have five, six years to avoid the worst," he added. And the worst will be a "secession", or as Gilles Kepel, the French specialist on Islam, called it: "La fracture." Macron, however, does not seem particularly receptive to Collomb's warning. A man reportedly shouting "Allahu Akbar" stabbed a police officer in Brussels this week, during a state visit by Macron to the Belgian capital -- the first for a French president since Mitterrand visited there in the 80s. Macron also went to Brussels' Molenbeek district, which he defined "a territory marked by the image of the terrorist drama and also a place of initiatives, sharing and integration". Sharing and integration? "One of 19 'communes' in the Brussels metro area, the neighborhood was home to one of the attackers in the 2004 commuter train bombings in Madrid and to the Frenchman who shot four people at the Jewish Museum in Brussels in August 2014. The Moroccan shooter on the Brussels-Paris Thalys train in August 2015 stayed with his sister there." If there is a place where Collomb's explanation about "secession" is not only a warning but already a reality, that place is Molenbeek. Roger Cohen, in The New York Times, called it "the Islamic State of Molenbeek." And such districts are not on a Belgian phenomenon. "Today, we know that there are 100 neighbourhoods in France that have potential similarities with what happened in Molenbeek", said France's then Minister of Youth Affairs and Sports, Patrick Kanner, in 2016. One is the town of Trappes, not only famous for the international soccer star Nicolas Anelka, but also for the number of jihadists from there who went to fight in Syria or Iraq. In France, six planned terror attacks have been foiled this year, the Secretary of State to the Minister of the Interior, Laurent Nunez, disclosed. "Since November 2013, 55 planned Islamist attacks were foiled thanks to the action of the intelligence services, including six this year", Nunez said. In the last few months, the current French scenario has not been dominated by new big terror attacks, but by a daily rain of intimidation. A Frenchman in his 60s was walking down a Paris street with wrapped Christmas gifts last week, when a stranger knocked off his eyeglasses before slapping him. "That's what we do to the infidels", the attacker said to the man. A few days before that, a French Jewish citizen was also attacked in the street by three men. "Now President Emmanuel Macron's government is considering giving parents a secular alternative to that intertwining of Arabic and Islam by prodding more of France's public schools to offer children as young as age 6 Arabic lessons..."
Robert Ménard, the mayor of the southern town of Béziers, declared that "teaching Arabic will create more ghettos". French authorities seem to ignore that the vast majority of terrorists from France have been French citizens, who spoke a perfect French and, unlike their parents, were born in France. They were perfectly "integrated". They rejected it. The confirmation of the Islamist wave came last September in a shocking report from Institut Montaigne entitled, "The Islamist Factory." It details the extreme level of radicalization of the French Muslim society. According to its director, Hakim El Kharoui, extremist Muslims in France are "creating an alternative society, parallel, separate. With a key concept: halal." Macron has done almost nothing to stop this expansion. "Two or three Salafist mosques were closed in 18 months, [but] foreign funding of mosques was not banned," said National Front party leader Marine Le Pen recently. The goal of foreign funding has been detailed by the former chairman of the Christian Democratic Party, Jean-Frédéric Poisson, in his new book, "Islam, Conquering the West". "The expansion of Islam in the West is part of a strategic plan developed by the 57 states that make up [the Organisation of] Islamic Cooperation -- a sort of Muslim United Nations -- which theorized the spread of Sharia law in Europe", Poisson said in an interview this month. "They openly declared the ambition to install a 'substitution civilization' in the West." There is, however, more than the cultural level. Philippe De Villiers, a politician and essayist close to Macron, recently evoked a phrase coined by his brother, General Pierre de Villiers, the former head of the French military. General de Villiers had warned Macron about a possible internal implosion in the volatile Parisian suburbs: "the darker sides of the City of Light". According to Philippe De Villiers, his brother would have said to Macron: "If the suburbs revolt, we would not be able to cope with it, we cannot afford to face it, we do not have the men." Two journalists with the mainstream newspaper Le Monde, Gérard Davet and Fabrice Lhomme, recently published a book entitled Inch'allah : l'islamisation à visage découvert ("If Allah Wills: The Exposed Face of Islamization"), an investigation of the "Islamization" of the large Parisian suburb of Seine-Saint-Denis. There and in many other suburbs, anti-Semitism is rising. According to the French Prime Minister Eduard Philippe, recorded anti-Jewish "acts" rose by 69% in the first nine months of 2018. Francis Kalifat, president of the official body that represents the French Jewish communities, has called anti-Semitism "a cancer." "In Aulnay-sous-Bois, the number of Jewish families dropped to 100 in 2015 from 600 in 2000; in Le Blanc-Mesnil, to 100 families from 300; in Clichy-sous-Bois, there are now 80 Jewish families, down from 400; and in La Courneuve, there are 80 families, down from 300." "We may be living the end of a civilization -- ours," says Philippe de Villiers, a French politician and novelist. "There are two points in common between the decay of the Roman Empire and our own decay. The Roman senatorial nobility, who thinks only of adding a layer of porphyry to their bathtubs, no longer considers the limes, the border of the Empire, as an emergency to secure". It seems that Macron has been busy only in adding a layer of porphyry to the Frances "grandeur". Last year, Macron presented himself as the candidate making a "a break with the system." In five years, his presidential mandate will be over. According to his former Interior Minister, Gérard Collomb, these will probably be the last years before the real "break" could become irreversible. Not only for France, but also for Europe. It is not easy to portray reality in 2018, unless you do exactly what this author is doing: stick to... reality. I live 15 minutes from Verviers, Djihad City (2nd to Mollanbeek only), on the German border, but in Belgium. I know and agree that it is a perfect depiction of what is going on, not least because I'm in a daily contact with friends in France and "Allahmagne". I am prepared for what is coming. Aux armes, citoyens! To declare that France and the EU needs to protect its self from the U.S.A. is an absolute display of stupidity by Macron. Had it not been for 'Life' sacrificing Americans, British and Commonwealth troops, Macron would not be in office today. I would suggest that he should, with humility, be compelled to visit the European WAR GRAVE CEMETERIES. He is an insult and a disgrace to FRANCE and to the Presidential Office of State that he currently holds. Thank you, Mr. Meotti! Such good writing about such bad tidings. So, the take away from this is the increase in traitorous behavior of citizens who earned French Citizenship by birth and were fully "integrated"; Anti-Semites; fresh immigrants who have always been endoctrinated to hate anyone who is not Islamic; and most importantly, the lack of men to fight any of the attacks for the safety and the guarding of local French citizens, both Jew and non-jew alike! And, according to an ex-Minister of the Interior, France has only five to six years to rise up and develop a plan to eliminate the drain on the nation and the French culture; and its' safety can no longer be measured by immigrant "integration", because it is no longer a benchmark for the security of France itself. Dire circumstances generally require dire actions. Wasn't that lack of military organisation at the heart of Frances' first succumbing to the incursions of WWII German troops? Infiltration into any society is always a very strong indicator of larger forces and agendas by a leadership far outside the scrutiny of local centralized intelligence. I believe France has a bought- and-paid-for-President, whose job it is to "soften up" the French people and their resistance to Islamic (Wahabi) leadership. Macron is a puppet for another global entity. It is sad that the common French people are standing before their greatest traitor, and they seem bemused by him. How does he manage to continue to govern, when the data and facts support his traitorous effect on his nation? Traitor and seditious leadership is at the top of this heap of rubble that is wholesome French Community. There is nothing to be ashamed of unless no one cares at all about stopping it. Money, position, and power are seductive. Holy is the man who avoids this seduction. But only unholy behavior can undo what has been done. Disarming a French President, and reading to him his calamitous, seditious, dereliction of his duty will NOT suffice. Who makes the decision to start the "flames" at the foot of his "stake"? Only the French people. But this time the "traitor" is a list of policies that should be burned....not the person or bureaucrats! Frank, the French people elected Macron by quite a margin after he promised them that he would progressively replace them with third world migrants. After that he promised to strip their rights, their culture and their religion. The French have never won any major conflicts they were involved in because of a total lack of mental resilience. This is why France will soon have an Islamist government and Sharia law. This is why the communist student protests of the late Sixties were so rampant in France. Hopefully, once France falls under the Islamic boot, the test of the "free" world will wake up, one can but hope. I hold no hope for France, their loser mentality has cast their demise in stone. Macron's remark echoed de Gaulle's after he pulled France out of Nato's integrated military command in the 1960s and then decreed that France's nuclear weapons were aimed at all points of the globe. What is extraordinary about what Macron said is that France has since fully rejoined Nato where it is an ally of the United States. Even given France's chronic anti-Americanism, no one expects the US to attack France or vice versa whereas an attack by Russia or China is at least conceivable if highly unlikely at the moment. If the EU's European Army is ever formed, France, like the rest of Europe, will still be dependent on US military protection. English is already taught in French primary schools and there is no reason why Arabic should not also be taught or any other language deemed useful by the education ministry. At the same time, France at all levels is suffering from Islamic schizophrenia. Sarkozy as president said with Merkel and David Cameron that multiculturalism had failed yet Macron wants to give Arabic privileged status in schools. Islamic activists may be encouraged to demand that entire schooling at all three levels should eventually be provided in Arabic for non-assimilationists. This already happened in Macedonia. Gérard Collomb, a moderate socialist and former Macron minister, was unusually explicit about his fears over continuing mass Muslim immigration and the time frame for dealing with the consequences. France prides itself as the country of logic and rationalism but both are sorely lacking as evidenced by the contradictory attitudes of Macron, Collomb and other leading politicians. Once the Islamic takeover of France is completed, France's military assets and nuclear weapons will available to complete the expansion of Islam over the world. Such a scenario would force the USA to attack France, well, that is, if the USA itself hasn't been overrun by "refugees" from South American states. Why is the west just ignoring what is going on around them? Why is nobody stopping this mass infiltration and feeling this takeover is inevitable? Now is the time to act, why are we helpless? Because we are all sniveling, cowardly sheep, more afraid of being called "racist" than of losing our entire culture and civilization. Europe has made it a crime to speak the truth, framing it as "hate speech". These elitist, blithering idiots actually believe that if you are just "nice", say politically-correct things and don't rock Mohammed's boat, that these tribal societies will come around. They believe a Disney fairytale and the people who would usurp our culture know how to use it against us. Churchill said it best: "Appeasement is like feeding an alligator and hoping it will eat you last." Political Correctness is the Suicide Pact of Western Culture. The West is too comfortable, unable to rise up because they want to keep their standard of living, make no sacrifices. Country means not a lot, culture has been slowly devalued by successive governments since Socialism in in the 70's which caused the breakdown of family through state interference moral bankruptcy, no self respect, or self discipline, drugs etc took over epidemic everywhere now...we've been crushed by reliance on benefits to pick up the pieces. I agree, when life circumstances become unbearable, people will wake up, but for some countries it will be too late. Italy is a good example, they have been tolerating things for years, but in one moment a tipping point was reached. I fear it is too late for France, they will get in some sort of chaos and social unrest or civil war. And this will spread in some neighboring country. Excellent article but the De Villiers brothers are not really that close to Macron. While we want France to be French, we don't want to blame all Muslims for the actions of the jihadis. That's reality. Islam is Islam. They use force, torture, intimidation, deceit, and psychological abuse to achieve their intentions, which includes conquest. It's the same methods described by world leaders 1000 years ago or less. They really are wolves in sheep's clothing thinking they're doing what's best for everyone. It's really hard to believe they're that ignorant of the damage they do their own well-being along with everybody else's. Every citizen could be a government spy eavesdropping on conversations in public places and hunting people down on social media and the various apps Jihadis use to communicate - a huge boon to the security services - the Muslims would have nowhere to hide. In Britain it would be more complicated because most of our Muslims are not native Arabic speakers but if every infidel had read the Quran in the original we'd be one up on our Muslims who can't do that and we could destroy all their nonsense on social media and elsewhere with our superior knowledge of their holy book - they'd really hate that. And we could go online and provide encouragement and support to closet apostates in the Arab world because we could speak to them in their mother tongue. Knowledge is power - the more you know about your enemy and their mentality the better - knowing their language gives you a huge advantage - and leaves them with nowhere to hide - Arabs hate that. The man who must save France is not Macron; Macron with his ploy of No to Nationalism on Armistice, and yes to Patriotism can be argued to be more treasonous than is realised. This stance has been recognised by professionals as shallow and hypocritical. The man who must save Paris, and then France is Michele Aupetit, Archbishop of Paris, who has more academic acumen and more far work experience as a professional than Macron. He is the one, the real Catholic who should be heard, not Macron. This is the Catholic who leads Paris, and thus Catholic France. The solution to the ills of France is touched on in the article by Le Pen. It is Muslim money that builds mosques. She is correct in her criticism. A simple law in France passed in parliament would fix that problem. Also, making it compulsory for CCTV cameras in every mosque would help keep Muslims terrorism under wraps. Any individual shouting Allahu Akbar in public is a possible terrorist, and also could be dealt with by law allowing Police to shoot to kill. Thats better than a policeman being shot at, or killed by a terrorist. No foreign police from Turkey or anywhere else should be allowed, and if resistance occurs, then the Military police should be called in and just round up suspects. There should be no jailing of offenders in France, but a removal of passports and all terrorists or suspected terrorists sent to St Helena permanently like Napoleon Bonaparte. Law and upholding of French law are vital. Sharia law should be made treasonous, and any found supporting Sharia regarded as racist, and penalised, for Sharia is indeed racist. This should be the attitude. But don't expect it from Macron. Queen Isabella of Spain had the same problem. She began work on the judiciary, cleaned up the law properly, and then applied the same options to Muslims that they had applied to Spaniards. It took years, but the problem was fixed. She had guts and she had brains. Arabic lessons for non-muslims might be a good thing. It might make ordinary Frenchmen more aware of what two-faced Muslim leaders say to their own people. The situation in France (and Germany) calls for the eradication of the Schengen treaty. These countries very likely will be our future enemies. EU countries like Italy, Austria, Hungary, Switzerland, Poland among others will not have their countries to be turned into caliphates. I remember Europe in the late 60's and early 70's when each country's culture was distinct. Now the culture of "inclusiveness" has largely destroyed the language and vocabulary of each culture as well as 'the national culture.' When Europe forgot about their God they accepted a bargain with the Devil. Amen brother! Good solid post! That really sums it up in a concise fashion. Two generations of Godlessness and voila'! Blessings! As Colonel Gadaffi once said, Europe will be conquered without a single shot being fired. He saw the arrogance of the ruling elite which undoubtably is going to lead to Europe's downfall. They say countries get the governments they deserve. Never more so in the case of the French. The only answer is another revolution like 1789. There will not be a secession by Muslims, but a conquest. There are already numerous areas under their control where non-Muslims and police will not go. As they increase in numbers and power, they will expand their territories of control, by force when they can get by with it -- and as more of them get into political office, the military and police, they will be more able to get by with it. Eventually, they will gain a level of power where no one can, or will stop them -- unless there is a reversal of the government policy that allows them to come, and stay, and refuses to apply force to control them. To prevent this, there would have to be an end to Muslim immigration, deportation of non-citizen Muslims, incentives for Muslim citizens to leave the country, and a general suppression of Islam among those who are left. Islam is the problem, and unless Muslims are greatly reduced in number and subdued by law until they have no power, or influence, they will fight for supremacy until they win, or die trying. None of this is going to be done with the present political leadership, or state of public opinion, nor with continuing membership in the EU. If the public ever comes to the conclusion that Islam is a problem that needs to be addressed, the opportunity for a mostly peaceful solution is likely to have passed, and war between Muslims and Europeans the only remedy left. Macron is a man who reasons according to the pattern of man, this world, and the god of this world. He is truly foolish. Sorry, France. Don't be too quick to think this will lead to a fracture and then we will have to live with that. Islam takes what it can get, then it goes for more until the whole is swallowed in Islam. The process seems to be already irreversible at this time. What is left of the western civilization is disappearing before our very eyes. This is being done by the West itself, by its neo-Marxist ideology, which destroys the cultural foundation of the western civilization. As to Islam, its purpose was and still is to facilitate the destruction of the western values. However Islam will eventually annihilate what left are trying to enforce today. The fact that the majority of French voted for their own demise, aka Emmanuel Macron, tells the story. They had a chance to elect Marie Le Pen's Front Nacional, the only party opposing islamization of France and attempt reversal of the damage. French have chosen otherwise and will reap the harvest they have sown. It has long been clear that Macron is out of his depth as President of France, although he seems to think along with his failed partner Merkel in Germany that he is joint president of Europe. Attempting to enforce his migration ideas on lands far from the borders of France. In other words forcing upon them the problems France has brought on itself. I am sure the French public are regretting their decision or rather lack of decisiveness in electing him. He seemed conveniently unaware that by giving his address under the Arc de Triomphe he was standing next to the most nationalist and imperialistic monument in Europe, dedicated as it was to commemorate the disastrous campaigns of Napoleon, which was costly not only to the people of the lands he sought to conquer but also to the male populations of France along with the countries which were forced to join him as allies. "'The expansion of Islam in the West is part of a strategic plan developed by the 57 states that make up [the Organisation of] Islamic Cooperation -- a sort of Muslim United Nations -- which theorized the spread of Sharia law in Europe...'" Is this where Obama got his famous "57 states?" Just asking. To think that my Canadian uncles fought in France in WW2 to liberate the French people from nazism - and to now see this country willingly submit to another form of totalitarianism. This dishonours the sacrifice made by thousands in WW2. Goodby France and all that was good about your country. This time around we in Canada and the US will not sacrifice our young people for you. This is such sad news. I remember how we loved France when we visited there years ago. Hopefully, there will be a way for a Resistance. Nobody wants to lose French culture with its art and amazingly delicious cuisine. Who wants to be Macron's successor after he flees to Switzerland or NYC before the tsunami hits la belle France? Hopefully all the Jews will have pulled up stakes and moved to better futures elsewhere - "never again", as this appears to be unstoppable. God help them since nobody in France seems to have the ability to put the toothpaste back in the tube. Given that Shahpour Bakhtiar was assassinated in France, and sanctuary was given to the Ayatollah Khomeini - I am not surprised to see the word "merde" used regarding France. It's as though many did not learn the lessons as to why Clemenceau, Picquart and Zola were right regarding the Dreyfus Affair. Not everything goes. It's not just in France that a general Islamisation is occurring. Much of Western Europe is facing the same challenges to Judeo-Christian civilisation, particularly by Islamic penetration of various sectors of government. The effect is a steady take over of controlling factors in society and this conforms with the Islamic doctrine of Hijra, that is migration and control. It was the late dictator of Libya, Gaddafi, who claimed that Islam would take over Europe simply by birthrate. His words are sadly proving true thanks to the ineptitude of Western governments. The same will undoubtedly happen in North and South America unless there is a dramatic change in the policies of the governments concerned. This describes exactly what is happening in France as well as the rest of Europe and his feelings about Macron and his approach is frightening, to say the least. We have been well and truly betrayed by politicians all over Europe who seem to have opened the hearts and minds to Islam and condemned us to a dhimmitude future with Muslims ruling the continent. Many leaders see the problems but refuse to tackle what is going on, it's almost as if they have been paid well or have simply surrendered to the threats issued by Muslims. I remember when Donald Trump became President of the US. Within months he was tweeting about "no go areas" in many cities in Europe, including London. The media jumped on this and denounced him as a "racist, Islamophobe" or other such rubbish label. He was proved right! Europe's leaders with a few exceptions are caving in to Muslim threats, they put pressure on governments behind the scenes and the governments give in without a murmur. They are so terrified of riots that they prefer to see their own citizens forced to accept Islam and eventually be governed by Muslims. Europe has its problems but they are also beginning to be part of the scene in the US. 2 Muslim women already voted into the Senate, the end is nigh and the US will soon be experiencing the same problems with Muslims that most European countries have. With fools such as Macron, May and Merkel, Europe will soon fall completely under Muslim rule. Cowardice is contagious and is destroying Western civilisation daily. Macron is not intellectually challenged; I think, therefore, that he does it on purpose. Anarchy must reign before a dictatorship is established. Very true. All this is being done as a part for the main plan. Here we are talking about conspiracy of globalists. The final goal is absolute tyranny. There is this dark/juvenile side of me that wants Death Wish XXIII, eg., a new Charles Bronson strolling the no go zones at night with his AK and a few frags. Lets see how bold Islam would be after a few weeks of not knowing which infidel would send them to their virgins. Alas, in the end it will be the French people that will have to rub it out, not a globalist puppet like Macron. No need for a goodbye to the E.U. It is already gone, not a moment too soon. Ingrate socialist whose country was saved twice by the USA. Next time if you like Shariah so much vote Democratic party, the same horrible Socialists as the Macron le con.